SkiA Sweetspot Trainer was invented by Dr Martin Breach - a medical doctor with an interest in sports medicine and biomechanics. In developing the idea, Martin worked closely with Hugh Monney, an ISTD Level 4 trainer, founder and Director of the British Alpine Ski School and former research scientist. Aware of how poorly-understood the concept of centered balance is, they saw the potential for a ski training aid to help skiers develop the critical skills of balance and co-ordination. The trainer was developed over a 3-year period, and was extensively tested in ski schools before being launched in the UK in early 2012. Fits every size of adult ski boot. There are definate advantages in starting young and learning good habits early. But these will correct old habits as well (especially for the parents) mums and dads love them. The SkiA Sweetspot Ski Trainer is a dry-land ski training device that can dramatically improve your ski performance and enjoyment. Use it as an essential part of your preparation and ski fitness program. Train your balance skills to radically improve your control in all conditions. Build your core strength and stability for both speed and safety. Practice accurate, sophisticated movement patterns, and give your skiing a winning edge. Develop your skills and ski fitness on dry land, and get the very best value from precious time on skis. Maximise the benefits of your investment in ski lessons, instruction and coaching; and get the most out of your skiing – forever. Bring it on your next trip (the gadget is small and light enough to fit in a large pocket). You can use it in your hotel or chalet, or even on the mountain. It’s the smart alternative to a large, heavy ski machine or expensive ski simulator. The devices are tough and strong, and come with a life-time guarantee. You can use them year after year, for as long as you ski. 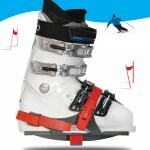 The devices are designed to be used with ski boots – with your ankles ‘braced’ by the boots, you have to use your whole body to balance. You really have to sense the balance signals from your feet, and engage your hips, shoulders, head and arms – right to your fingertips - to stay centred. It's a workout for the whole body, that trains ski fitness the smart way. No other balance trainer works this wayIt’s a patented new concept and a unique challenge. The SkiA Ski Trainer allows you to practice and refine exactly the skills needed when skiing, as a highly effective ski simulator. Using our ski training program, you can train in just minutes at a time - yet the skills last a lifetime. They’re also great fun for all ages and every ability! Included are 4 pairs of balance blocks, which get progressively smaller. The blocks centre under the ski boots, so that you balance exactly on centre. When you ski, this is exactly the right place to aim to balance – why centred balance matters. We guarantee to improve your resultsThe SkiA Ski Trainer is proven to work for skiers of every ability, from absolute beginners up to and including Olympic ski racers. They are used and recommended by ski instructors, top race clinics, leading ski schools and professional ski organisations worldwide.